If you love the sea and beautiful sandy beaches and if you’re interested to find out about Holland’s struggle against the waters and about our seafaring history, this might well be the tour for you. The landscape is so varied; it will never cease to delight you. The beach is backed by beautiful windswept dunes. Behind the dunes, in spring, multicoloured tulip fields will take your breath away. A string of coastal villages and resorts lead you down to modern Rotterdam which has the largest port in Europe. River landscapes, lush meadows, ancient farmhouses and dikes will feature on the last part of the tour. 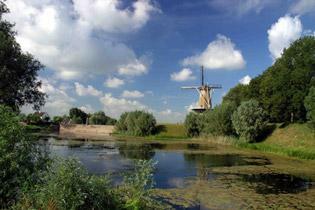 Visit old-fashioned fishing villages, polders and windmills. See an exhibition explaining why and how Zuiderzee sea was made into Lake IJsselmeer and then partly drained to create Flevopolder. When looking around towns on the coast of former Zuiderzee you will notice beautiful 17th-century houses built in the days when the Dutch East India Company made a fortune trading in spices and bulbs. The Dutch dominated world trade (ruthlessly, it must be said...) and rich merchants sponsored arts and sciences which flourished. 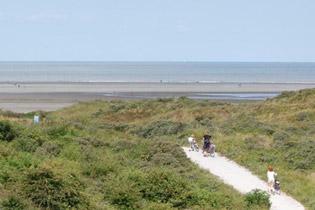 As to the difficulty of the Sand and Sea cycle route, it will depend on the wind. Cycling down the coast through undulating dunes with a headwind can be a challenge. As on all our carefree cycle tours, we provide luggage transfer and excellent accommodation.